Background: Few studies have examined common childhood infections and adult asthma. 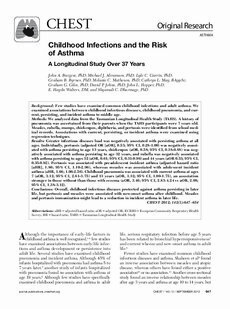 We examined associations between childhood infectious diseases, childhood pneumonia, and current, persisting, and incident asthma to middle age. Methods: We analyzed data from the Tasmanian Longitudinal Health Study (TAHS). A history of pneumonia was ascertained from their parents when the TAHS participants were 7 years old. Measles, rubella, mumps, chickenpox, diphtheria, and pertussis were identified from school medical records. Associations with current, persisting, or incident asthma were examined using regression techniques. Results: Greater infectious diseases load was negatively associated with persisting asthma at all ages. Individually, pertussis (adjusted OR [aOR], 0.53;95% CI, 0.28-1.00) was negatively associated with asthma persisting to age 13 years, chickenpox (aOR, 0.58;95% CI, 0.38-0.88) was negatively associated with asthma persisting to age 32 years, and rubella was negatively associated with asthma persisting to ages 32(aOR, 0.61;95% CI, 0.31-0.96) and 44 years (aOR 0.53;95% CI, 0.35-0.82). Pertussis was associated with preadolescent incident asthma(adjusted hazard ratio [aHR], 1.80;95% CI, 1.10-2.96), whereas measles was associated with adolescent incident asthma (aHR, 1.66;1.06-2.56). Childhood pneumonia was associated with current asthma at ages 7(aOR, 3.12;95% CI, 2.61-3.75) and 13 years (aOR, 1.32;95% CI, 1.00-1.75), an association stronger in those without than those with eczema (aOR, 3.46;95% CI, 2.83-4.24 vs aOR, 2.08; 95% CI, 1.38-3.12). Conclusions: Overall, childhood infectious diseases protected against asthma persisting in later life, but pertussis and measles were associated with new-onset asthma after childhood. Measles and pertussis immunization might lead to a reduction in incident asthma in later life. © 2012 American College of Chest Physicians.